68% of Moldovans believe the relations with the European Union are good – well ahead of the average of 61% in the region. There has been no rise in anti-EU sentiments in the Republic of Moldova (17% as in 2016). 43% of Moldovans have a positive image of the EU. Moldovans who have a positive image of the EU tend to strongly associate EU with human rights, individual freedom and economic prosperity. 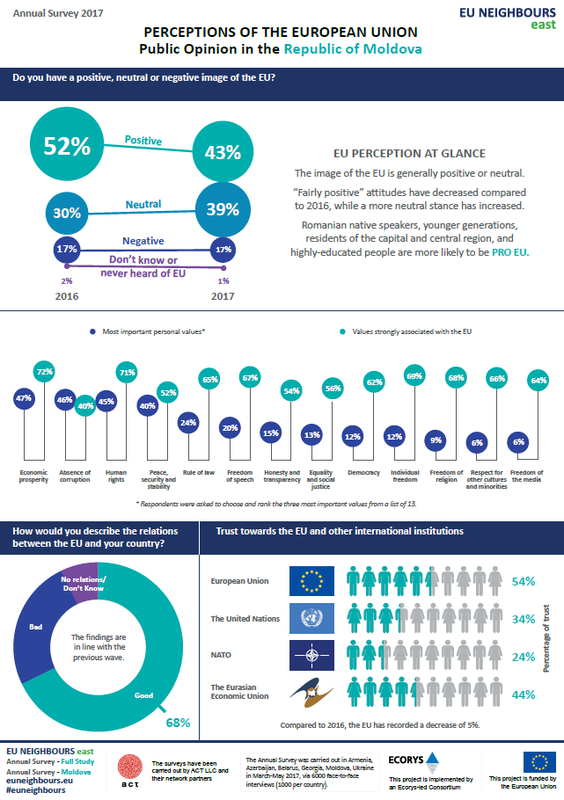 54% of people in the Republic of Moldova trust the European Union, followed by the Eurasian Economic Union (44%), the United Nations (34%) and NATO (24%). 79% of Moldovans are aware of the EU’s financial support to the country and 37% believe that EU support is effective. To find out more about EU – Republic of Moldova cooperation and partnership, go here.